Breath of the Wild: Why Durability is Worth the Pain – What's in a Game? Durability has been the biggest source of contention in Breath of the Wild. Some players detest the mechanic, while others praise it. I’ll explain how this durability system is one of the crucial pieces that make Breath of the Wild such an amazing open-wold experience and how it sometimes feels like a necessary evil. Players pick up weapons, shields, and bows from monster drops or chests. Each of these items has a hidden durability stat that decreases anytime the item is used. When this stat reaches zero (which doesn’t take long), the item breaks and you must equip another. It discourages using most of the cool weapons you find for fear of losing them and turns their acquisition into something unexciting, almost disappointing. There’s no indicator of how much durability is left until it’s almost done. Once it’s almost done, you’ll see an annoying message every time you take it out. I can understand these thoughts and indeed felt some of them, as well. In time, I realized my problem was more with the user interface and experience in the game rather than durability itself. In reality, durability contributes to one of the main themes of the game, exploring various solutions to achieve the goals you want, and allows the game to create an open-world experience that is a breath of fresh air. Weapons degrading contributes to managing the difficulty of the game allows the game to be a more open-world experience. The weapons you use tend to be around the strength of the area you are in because you are picking up weapons from that area. Using a strong weapon in a weak area will cause it to break, and you’ll be left with only the weak weapons dropped in that area. All it takes is to kill one strong enemy in a strong area and you will get a strong weapon, which makes the area easier to deal with. The spiky difficulty curve leads durability to be a crucial component to keeping the player engaged throughout the entire game, even in an open-world setting. My post on flow talks more about managing player engagement in BotW. Rewards in the game are mostly lacking in the game. There’s tons of enjoyable content, but sometimes I just want something really good for doing a shrine. Weapon durability contributes to finding useful rewards consistently throughout the game. Durability allows the game to give you powerful weapons early in the game because it knows that you won’t be able to use it forever. These powerful weapons function as a great reward. Since these weapons won’t last forever, the game can keep giving you great weapons as rewards. This gives the game designers something meaningful to put in chests and fill the vast open-world with content the player cares about. While not as exciting as a piece of heart or new unique item from previous Zelda’s, it’s still pretty fun to find a Great Flamesword after you’ve run out of other good weapons. Without weapon durability, the player would quickly run out of meaningful rewards in the game, and the vast world would be less fun to explore. Additionally, if you see a good weapon on an enemy that you want, you’ll be encouraged to fight it. Since it’s a good weapon, this will make the enemy harder to fight. This means the player has to make an interesting choice – take the risk and fight this difficult enemy to get a good weapon, or just bypass it and save your current resources. Durability brings strategy into the game. Since you know your inventory is limited by durability, you are encouraged to think outside the box and give you interesting decisions. You want to use the right weapon for the right type of enemy. If it’s a weak enemy, don’t waste your strong weapon. It might be an enemy you need a reach for, but your only spear is your strongest weapon. You might want to save it for a harder enemy, so you wonder if it’s the best choice here. It even opens up the possibility to think things like, “I wonder if I can fight these enemies without using weapons?” This thought leads you to look at the surroundings and take advantage of them. If players could always use the Master Sword, they would be more likely to just go in head first and attack because they have nothing to lose besides health. Durability forces players to go outside their comfort zone and try new things. If I got used to the one-handed swords in the game, I may never even use spears. Durability makes it so the weapons you use the most will break making the player more likely try new things and learn new playstyles. This both affects strategy in the moment, by limiting what you can do, and helps you understand mechanics to think more strategically in the future. Let me hit stasised objects (maybe trees and ore, too) without losing durability. It’s just tedious to have to switch out to a crappy beater weapon to do those things. A better indicator of just how damaged a weapon you have is. Speaking of which (although somewhat unrelated to durability), make the user experience when picking up an item when your inventory is full better. That message really wastes time and reduces the impact of finding a nice weapon in a chest. Sheilds should not lose durability for performing the most awesome move in the game, the shield surf. It just discourages me from having fun. 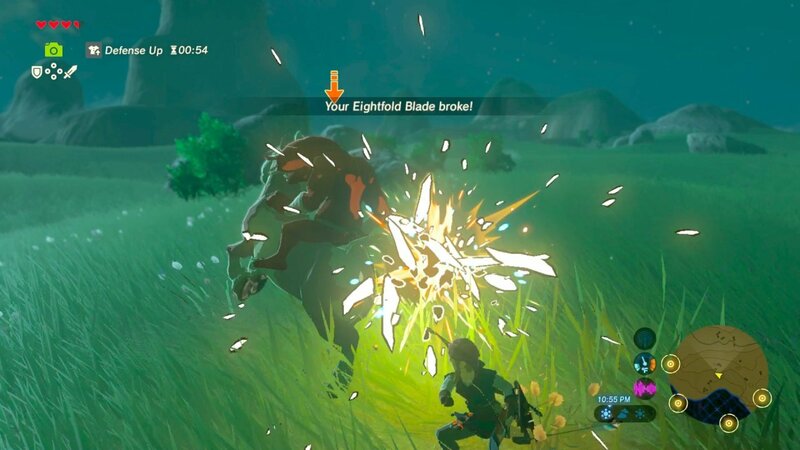 Durability is at the core of BotW’s open-world philosophy. Without it, the game would have problems managing difficulty and keeping player engagement constant. It may annoy people, but several of these annoyances are related to the user interface and usability of the game. Nintendo could’ve done simple things to help people embrace durability rather than detest it, but still, it’s a necessary mechanic that adds reward and strategy to the gameplay allowing the game to be the open-world masterpiece it is.